Seminar provide a multidisciplinary and innovative perspective of new digital museological techniques of urban environments. There are many intellectuals who in recent decades have understood “the city as a museum of historical memory”. Thus was born the so-called Urban Museology ie the interpretation of the city as a museum object configured by its architecture, history, art, culture, etc. It is therefore a version of the museum outside the museum, a “city musealization” that intends to apply the museological strategies into the urban fabric as a form of socio-economic and cultural revitalization of historic city. New technologies, especially those related to 3D, open the possibility of going beyond, to help citizens and tourists to be aware of the transformations of the city and the surrounding territory along its history. 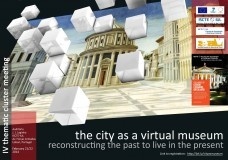 The city and virtual museums are an odd couple begins to establish itself as a formula for success in many countries. possibilities offered by three-dimensional reconstructions in the valuation of historic cities. The seminar is aimed at professionals, researchers, students or interested: art students, architects, museum curators, curators, designers, heritage specialists, archaeologists, historians, restorers, computer technicians, Cultural and Heritage managers, teachers, etc. And all those research groups, companies and institutions develop their work in the field of documentation, conservation, preservation, presentation and dissemination of urban cultural heritage.